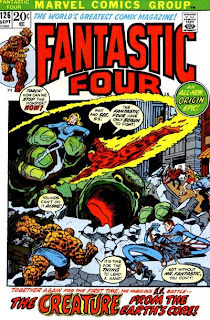 The sixth Essential Fantastic Four volume is the first volume in this series without any work by Jack Kirby, and it shows. The initial Lee/Buscema/Sinnott stories at the beginning of the book seem to be done in autopilot: while the art is very good, the stories are lackluster and rather inconsequential (though I can't deny a small thrill upon seeing the Silver Surfer and Galactus drawn again by Buscema, only a short time after the cancellation of Silver Surfer solo book that Lee and Buscema did together). Things improve when Roy Thomas takes over the book (at the same time he became Marvel's editor-in-chief), with a story in which Thomas does his usual playing with Marvel continuity, this time tying the Mole Man and Tyrannus with a little-known subterranean character from an early Iron Man story. As you can see, the title has now become "The World's Greatest Comix Magazine", seemingly in a nod to the underground comix movement (rather appropiate in a story involving the Mole Man). This change lasted for only a few issues (things are back to normal by issue #134, with the masthead once again saying "comic magazine"). Don't recall. May have been my idea, but if so, was no better than Stan's short-lived "Pop Art Productions" of years before. we were comics, not comix. Only a couple of years later Marvel would publish something closer to a "comix magazine": the fabled Comix Book, with work by several of the leading underground creators of the day.